"the Tenth Muse." Photo by C.M. Mayo, 2017. 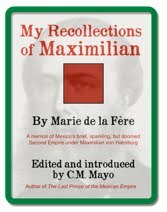 As I told Paula, woefully past the deadline, I had asked the Muse for a slider, a yummy little note about books in Mexico, but she delivered the whole ox. 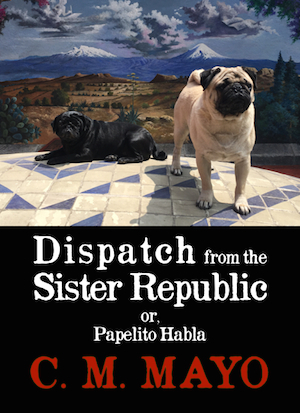 In other words, my "Dispatch from the Sister Republic or, Papelito Habla" is a novela-length essay about the Mexican literary landscape, from prehispanic codices to contemporary writers. It is what it is, I don't want start chopping (there would be blood!! ), but of course, a 30 page essay is too long for a magazine. As for my full-length essay, "Dispatch from the Sister Republic," look for it as a Kindle under my own imprint, Dancing Chiva, ASAP. it is now available in Kindle. 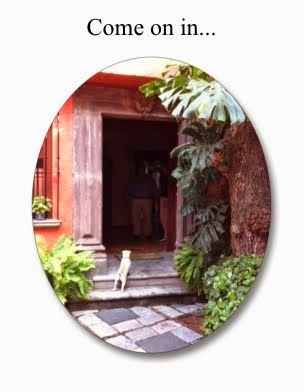 For rare book collectors, Mecca is Mexico City’s Colonia Centro, and for such aficionados of mexicana as myself, its sanctum sanctorum, the Librería Madero—by the way, recently relocated from the Avenida Madero to the Avenida Isabela La Católica, facing the the formidable wedding cake-white corner of the 16th century ex-convent of San Jerónimo, known today as the Claustro de Sor Juana, that is, the Convent of Sister Juana. And if you would not know Sor Juana from a poinsettia, gentle reader, with all respect, you must crowbar out that boulder of ignorance, for which you will be rewarded by a glimpse of the diamond of the Mexico’s Baroque period, the first great Latin American poet and playwright, “the Tenth Muse,” a cloistered nun. And perchance startling discoveries. In his 2011 El eclipse del Sueño de Sor Juana, Américo Larralde Rangel makes a radiant case that her “Primero Sueño” describes the dawn over Mexico City after a lunar eclipse on the solstice of the winter of 1684. In the Librería Madero I find on the first shelf, facing out, two new books by sorjuanistas: one about Sor Juana’s family, another, just published by a Legionario de Cristo, that purports to decipher her twenty enigmas. The latter work incorporates a series of contemporary paintings of Sor Juana in the baroque style—dim backgrounds, crowns and scepters of flowers, and afloat above her head, fat-tummied cherubs, flounces, unspooling bundles of draperies. But these Sor Juanas look too pert, make too coy a tilt of the head. It seems to me as if, session over, the model might have just tossed off that habit to wriggle into some yoga wear. Yes, just as in the United States, in Mexican cities yoga studios have been popping up like honguitos. 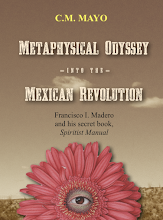 But if a vision of modern Mexico would have been obscure to Sor Juana, by no means is Sor Juana obscure in modern Mexico. 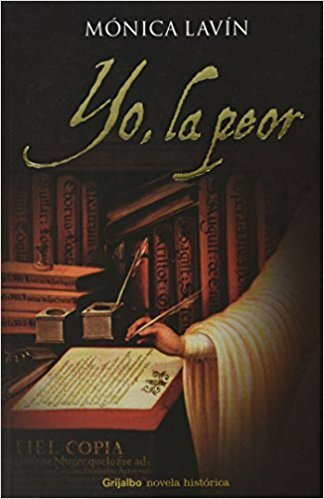 She has inspired scores of poets and musicians; there have been movies, documentaries, and novels, most recently, Mónica Lavin’s 2009 best-seller Yo, la peor (I, the Worst—yet to be translated into English—fingers crossed that Patricia Dubrava will do it). 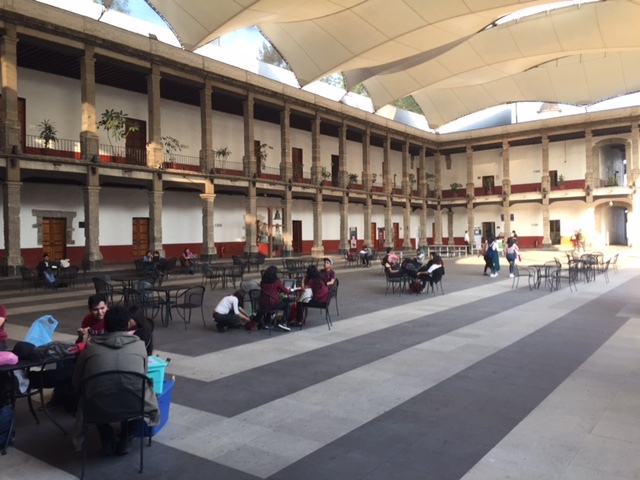 Mexico City. Photo by C.M. Mayo, 2017. I cannot pretend to render the music of Sor Juana’s lines into English. But here’s a rough go at their literal meaning: You pig-headed men who accuse women unjustly, blind to the fact that you are the cause for that which you cast blame. P.S. Those of you who follow my blog may be wondering, what in blazes does this have to do with my book in-progress on Far West Texas? More anon about the truly fantastic connections. 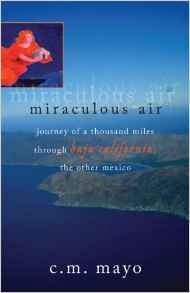 I'll be giving my annual one day only workshop on Literary Travel Memoir at the Writer's Center in Bethesda, Maryland this April 22. [Learn more and register online here.] New in ye olde packet of handouts for this workshop is "Words I Like," my name for a powerful yet simple practice that you might think of as Feldenkrais for your vocabulary. As writers, albeit human creatures of habit, we tend to use only a woefully limited portion of our vocabularies. Hence our first drafts may be stiff, dull, and vague. To add verve, freshness, and focus, it helps to loosen up our mental joints, as it were, and reach for a greater variety of words. 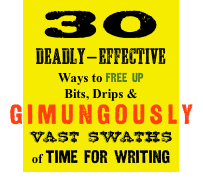 The challenge is not necessarily to expand your vocabulary --I am not talking about trying to sound fancy-- though perhaps you or one of your characters may want to do that-- but to bring more of your writerly attention to words you know but do not normally use. Towards that end reading is vital-- but not reading passively, as a consumer of entertainment, nor reading for facts and concepts, as would a scholar. Instead, read as a writer, with a pencil or pen in hand, noting down any words that strike you as especially apt or somehow, for whatever reason, attractive to you. These might be simple words such as, say, brood; caprice; crackpot; pall; nougat; persimmon. When I read I keep a notebook, PostIt, or index card handy so I can jot down any words and phrases that I like. I used to worry about keeping all these notebooks and bits of paper in some semblance of order, but I now believe that most of the benefit is in simply noticing what it is that I like; and second, writing it down. (In other words, when it comes time to declutter, I will, as I have, and so what?) Of late I toss these index cards in a recipe box that I keep on a shelf behind my desk. When one of my drafts needs an infusion of energy, I pluck out a random batch of cards, shuffle though them, and see if anything might be of use. Often it is. She failed to grasp that he would never relent, he was a thieving toad. "Birds of prey don't sing"
"the apostles of -- "
Bonhomie! I love it! Why? 'Cuz! 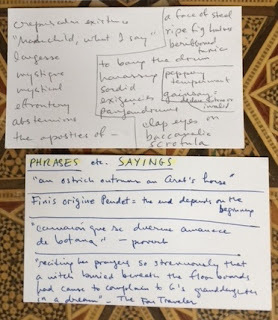 From that second index card pictured above: bonhomie; obviate; banal; decrepitude; penumbra; chronic; salient; pieties; vim; dour; bouyancy; bouyant; circumlocutions. Why these words? Because I like them. You might not. The point is, as you read, write down whatever words you like. Well now, I hear Henry James' Muse yelling! So many salient pieties... In the penumbra of his chronic bonhomie, she felt at once dour and bouyant. >> For more on reading as a writer, see my archived blog, Reading Tolstoy's War and Peace. P.S. Still working on Marfa Mondays Podcast 21. Twenty podcasts have been posted so far; listen in anytime here. I didn't put it this way in that post, but now that I've grokked the term ludic loop, I must say, that rrrrrring slices right through it. In other words, paradoxically, the reason I was drowning in email was that I was spending too much time on it. That is, I would get stuck in a ludic loop, checking, looking, checking, looking. Yes, indeed, gentle reader, batching with a stopwatch works. But of course, when it goes off, you have to actually stop. I added the habit of standing up. Bell rings, I stand up. Which stopwatch to use? Of course everybody and their uncle's cousin's zonkey has a smartphone with a stopwatch app, and I know, for a lot of people, especially those under the age of 30, any other option would be, like LOL, a total eye-roller. For those answering email on their laptop, such as myself, I recommended using a free on-line stopwatch (get yours here). 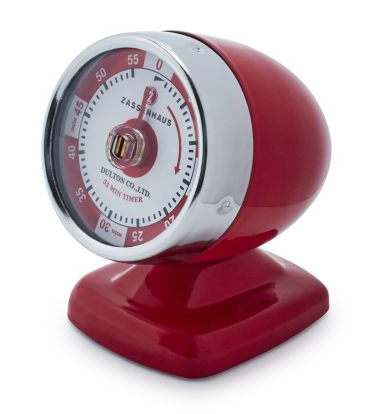 But of late, I have switched to using a mechanical Zassenhaus kitchen timer. * I chose that particular brand because it's better quality and heavier than the average cheap-o plastic kitchen timer. Why an old-fashioned kitchen timer, pray tell? Because using something not on the computer screen but in the real world-- ye olde meatspace-- helps me stay focused on the task at-hand. It's one less reason look at the "desktop," one less thing to have to go click on (and so reduce the risk of another journey down the rabbit hole, or to put it another way, of getting caught in a ludic loop). As I quoted David Allen in my guest-blog for "Cool Tools" on why I use a paper-based organizing system, "low-tech is oftentimes better because it is in your face." Methinks Dmitry Orlov is onto something. But that's another post. *Perhaps you are wondering if I have not heard of Francesco Cerillo's The Pomodoro Technique and his tomato-shaped kitchen timer? (Pomodoro means tomato in Italian.) Actually, I have... long, long ago... so long ago that I had entirely forgotten about it until this very moment! Well, definitely, Cerillo is onto something! 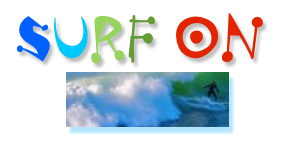 Check out his website and watch his introductory video about the technique here. But I am not actually using the "pomodoro" technique which, as I understand from having just watched the above-linked video, is about doing all kinds of work in stopwatched 25 minute "pomodoros," or chunks of time. For the past months I have been working on email in not only 20 minute batches but also 10 minute and, on occasion, even 5 minute batches. Neither do I want to stopwatch all the work I do... I like a lot of fluidity in my day. assume energizing random yoga poses.